With our 40 BAGS IN 40 DAYS decluttering challenge this year, I’ve been thinking a lot about decluttering the areas of life that aren’t stuff-ish. The stuff that nags on you like emails or your cleaning schedule that NEED to be organized and worked out. For me, having a flexible schedule and check off lists helps me stay in check. Once I get away from that, I get overwhelmed and unmotivated. Short-term “baby steps” goals are better than looking at the big picture, and rewards help! I also like making goals and working towards them before I focus on the next thing. I’ll be adding more as I think of them and as you suggest them! delete items out of your “downloads” folder, or put them away where you need them. Set up new folders and organize, being as specific as possible. keep only the most basic folders or programs that you need on your home screen, organize the rest. archive everything (or just the important stuff) so you can still find it in search. It’s a lot easier to “archive all” than to delete all! when your inbox is clean, either delete, archive, or unsubscribe the new items that roll in. reply immediately when you get the message. If you don’t have time to reply , delete, or unsubscribe, you don’t have time to check your email! try to have a spending freeze and limit yourself for a period of time. create a list in your phone (Teux Deux is a great app for lists), or alerts to help you remember key things. I have one in my phone for am vitamins, pm vitamins. think in baby steps, what little things can you change in order to get there? find what works for your family: one load a day? two loads a day? Here’s a look at our laundry schedule for a family of five. if you don’t meal plan, try to have an idea of what you’ll be making early in the morning. Do prep as you can through the day to lighten your burden. Take note of what items need to be eaten, used up. Think of different ways to prepare your leftovers or freeze them before they go bad. Have a few options on hand for quick, but healthy meals and snacks. Have a few go-to meals that you have down and can make quickly in a pinch. check your settings to see which apps use the most space and if you don’t use them, consider deleting them. delete old text messages, voicemails, or calls. have your photos printed out using an app like Walgreens, Postal Pix, etc. when uploading, keep only the copy you want. Delete multiple blurry or junk copies right away. create a folder in your computer and organize there, once you’ve finished the month, upload to your preferred storage method. Print photos off as you need them, or monthly. Make a list of what needs to get done, follow through, but don’t overwhelm yourself. Start small. Use phone or online calendars, big wall calendar, or pocket calendar. Find what works for you and put everything in there. Try to stick to it, and if it doesn’t stick, find something else. Put stuff on your calendar as you think of it. Set alerts or alarms or timers. Anything I missed that you’d like to see covered or added to this list? I tend to find it very difficult to let go of things, even when they have little significance and are just material belongings. I’ve heard of the challenge before but only just realized that the intention is to coincide with lent, which makes perfect sense. Though it’s only been two days, I feel like I have a different mindset – that letting go of these things are only a small sacrifice in comparison to the ultimate sacrifice that was made on the cross. Though I am concerned that I will find it difficult to balance the demands of full-time work, maintaining a house and completing this challenge as my Lenten sacrifice, I’m aiming for success with making some sacrifices in my home and being a blessing to others. Would love a printable of the non-stuff list! Thanks! Oh, this is a good list. I can feel butterflies around organizing photos. Yikes! Just don’t get the cloud and what to do with photo storage… Any recommendations as where to store them? Also – would love a printable page of this list. Thanks!!! I wondered if you have anyone or even yourself that has given you any tips for people with chronic illness and this area. My husband is my husband trys very hard as a truck driver let’s face it they just don’t have the same ideas we do, where this all use to land on me but the past 12 yes my health has declined my mobility has declined and if you know about the spoon theroy if I do these kinds of things then I don’t get a shower or a walk or I even forget to eat because fatigue sets in, but if I do basic life stuff like shower and eat and take care of myself then the house suffers for 12 years I’ve been battling a balance because church is important to me I have to limit what I do on Tuesday and sat to attend on wed n Sunday and so I have most of my doctors appointments on Monday Thursday and Fridays leaving little or no energy for any of these things. I’m going to do this challenge mainly for mail I have boxes of mail we never go through I bet you never guessed its doctor bills and insurance papers but it just gets out of hand. Before my health I was on the ocd side so this has been a real struggle for me I want to minimize I just don’t know how to start. Do you have any family members nearby or could you ask your church if someone can come help? A family from church with high school aged kids? Or even a local high school chapter of the National Honor Society in need of volunteer hours, or members of a scouting troop? I’ve battled health issues in the past, but have not written a post on them. It’s so hard when you want to do the work and physically can’t. I wish I was closer and could help you find someone who could be your hands! But I would say that finding help is the best place to start. You’ll be in my thoughts and prayers, please keep me posted Tammy! hi Tammy I feel as you do.I am unable to declutter and have noone to help me,I have a mess I have a small 1 bedroom with no storage anywhere. so i lay things on shelves ,tables..its rough i try to get up and toss some things but once I start i dont want to start but I hurt so bad after i stand 10 minutes its aweful..if i had help it could get done maybe in two days but just me a long while..
-old non-digital family photos and albums currently stored in big plastic bins, some are of people we do not know and don’t have their stories or names. Same as the keepsakes noted below. -keepsakes, heirlooms, etc. I have a drawerful of embroidered pillowcases, runners and table covers that we don’t know who or why, some are oddly shaped for today’s furniture. In other words, the family stories were never told to us, so they just fill a drawer or two. I have considered sewing them together to make quilt(s) but then what? It’s this kind of personal stuff I don’t quite know about it, but not sure what to do with it. Like the photos. Sorry, I put this in the wrong place. I just realized this was a non-stuff subject, and this is stuff. I’m also a HUGE advocate of de-cluttering electronically – my computer, inbox AND mailbox! My boss introduced this challenge to me last year and I was amazed at how much “stuff” I still had and the progress I made. Thank you! I found my life to be much more simpler without receiving catalogues and a ton of other junk mail and wasting my time going through all of it. Also, the other big part is saving the environment! So I’ve unsubscribed from email lists, junk mail (even direct mailers like PennySaver, Red Plum, Valpak! ), catalogues, signed up for the do not call registry and more. I made each task a “bag”/item, e.g., unsubscribing from emails one day, printed junk mail another day. If anyone chooses to include this in their 40 Bags challenge, I’ve collected some helpful resources and would be happy to share! This year I plan to consolidate my email inboxes, switching everything over from one email to a new email – that will be a big task, but I’m all for making my life easier. 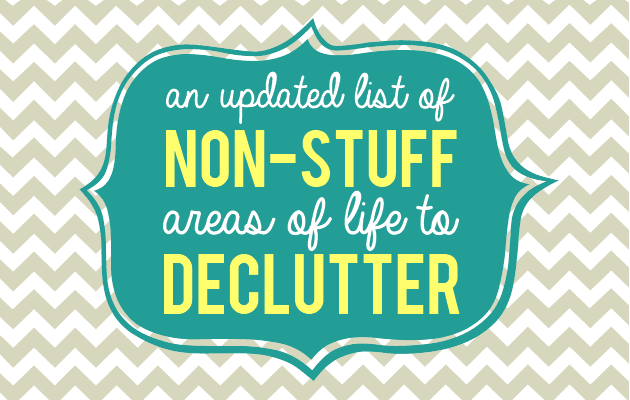 Thank you helping make life less cluttered! I found my life to be much more simpler without receiving catalogues and a ton of other junk mail and then wasting my time going through all of it and the other big part is saving the environment. So I’ve unsubscribed from email lists, junk mail (even direct mailers like PennySaver, Red Plum, Valpak! ), catalogues, signed up for the do not call registry and more. I made each task a “bag”/item, e.g., unsubscribing from emails one day, printed junk mail another day. If anyone chooses to include this in their 40 Bags challenge, I’ve collected some helpful resources and would be happy to share! This year I plan to consolidate everything over from one email that to a new email – that will be a big task, but I’m all for making my life easier. Thank you, White House Black Shutters! I unknowingly started the 40 bag decrappifying Saturday. I went through and tried on all my clothes. I’m finishing a year of no buying shoes in March and cutting way back on shopping. In March, I plan on starting my second year of no shoes and add clothes, accessories, and anything that isn’t a consumable. I’m selling my clothes on Poshmark. It’s a long process, but I make my money to buy my books each semester from selling my (plus my friends, Mom’s, and sisters) clothes. I need to purge my iTunes. I have 10,500-something songs on there and 10,000 or them I don’t even LIKE anymore. In Fall 2009, I ended up getting that H1N1 swine flu that was going around and, even though I felt ok after a few days on Cipro, I was still quarantined in my house for a full 10 days. Suffice to say, you have NO IDEA how many Christmas songs you can download when you are bored and stuck at home. It’s mind-boggling. Darling Daughter sent me a link to your very helpful challenge. We’ve already put a great portion of our goods in storage while house is on the market — but there’s still a grand opportunity in joining the challenge. Keep a magnetized pad of paper on the refrigerator to jot down items as you run out of them. Makes your shopping list effortlessly, and ready to go when you are. Any ideas for what to do with old photos? i have hundreds and can’t figure out what to do with them. I only see them about every 5-10 years when I “decluttter.” Trying to get it resolved once and for all. I’m going to put mine into 4×6″ file boxes, divided by year and occasion. Then they can be taken out one small bunch at a time, looked through, and placed back in its divided spot. The work is going to be writing on the back of each picture a code of where it should go, in which box, if it gets mixed up or separated from its box. I haven’t worked out the code yet. I’ve saved many of the pictures in their envelopes which should help the sorting. I’ll probably make albums of the most special or ‘representative’ ones (one from each Easter, birthday, etc. over the years.) I’m interested in other ideas, too! When I upload photos to my computer (organized in folders by year and month), I have started trying to take a few extra minutes to tag the photos with people and topics. So next time I’m looking for photos or want to make a collage of a particular person or topic (like photos of my daughter from her martial arts activities), I can easily find them based on the photo tags. I am constantly in a state of decluttering, but the older I get and the more people I see that have died and left a horror story for the children to deal with, the more motivated I am. I know that my children will not want about 99% of my stuff so I am trying to make a written guideline so they don’t sell a treasure for a quarter in a garage sale. My best tip, gleaned from the bible of organization as far as I am concerned, Sidetracked Home Executives, is to start at the door of a room and work either to your left or right and tackle each thing as you get to it. Don’t bounce around the house/room. Slow and steady. Touch everything and make a decision. Garbage, proper storage, sell or donate. When you run out of time or energy, quit. Go back to that same spot the next time and carry on. i started the challenge last week and have filled 8.5 bags of clothes and 1 box to charity that will go out next week. i also, semi-organized photos into 2 tubs that i want to go through when most of my declutter is managable. I love this group as It has motivated me to do a little each day and i will get there. Now, to get my family more on board. My hubby helped a little over the weekend, so that is a start. I’m with Virginia Jolly! Do you have any suggestions for paperwork clutter? I’m constantly buried in paper! Thank you. I have been working on my files. I love your question mark file suggestion! One thing I know I have to do all the time is paperwork. Every day there is junk mail, and I have to decide how pertinent it is, how to recycle it, destroy it, or file it. I need to create a habit of doing the paperwork when it comes in. Oh, and my file cabinet could use a lot of work, too. Hey Anne – love all your ideas! could you find time to make a PDF of all these non-place ideas? Would be so helpful! Thanks and keep up your good works! I am so happy my friend Julie told me about this. I am so disorganized, cluttered, and really need your help! My disorganization is so bad I can’t right now even get into my gmail account because I can’t remember my password! Please tell me why it won’t let me change my password! It just wants me to delete my account which I do NOT want to do! If you can help me with this, you will have saved my life from more clutter and disorganization! I need your help! OH– I thought I was behind already. THEN– I remembered that on Monday morning I came in to find my freezer door had not closed tightly and all my vegetables were defrosted. I spent the day cooking to save what I could and later told a friend– as frustrated as I was about the whole thing — I’m so excited that my freezer is cleaned and organized, it was worth it. So I did not start a day late– I started two days early! Let the declutter continue! I wanna be free! I was starting to get that itchy feet, time to move home feeling again when it occurred to me it’s not where we live but how we live is the problem. I now feel motivated to declutter and remove all the junk so I can enjoy my home again. Thank you. Declutter your Facebook friends!!! Get rid of the people that post negative posts or whine a lot!!! They just bring you down and clutter your mind with worry~ I’ve downsized my friends list to people I actually talk/email with; and as the saying goes, “If I didn’t talk to you in high school, why would I talk to you now?” LOL! I have so much to get rid of that it is overwhelming. I start, and then get so distracted that I make it worse. I am going to try this plan – thanks for the lists too! dont forget to delete old text messages. I have years and YEARS worth of personal mementoes, souvenirs of places I’ve traveled, trinkets that have special meaning, gifts from loved ones…. (I’m not necessarily attached just because it’s a gift but if I love it then it has a double sentimental value). I have a curio cabinet with many of these things but I also have boxes that aren’t displayed. every time I look at everything and think of the boxes I feel compelled to organize, condense but I just can’t bring myself to discard things that bring back memories….. what to do? I like the idea of Christmas ornaments! Thanks! Your daughter is smart! I’ve thought about giving things to friends/family with a note attached of the special meaning it brought to me. Thanks for the suggestion! GREAT CLEAN-UP DAY The weather is awful, cold, windy and great day for spring cleaning (otherwise known to us as de-cluttering). I have a full grocery bag of to be shredded papers from nineties and early 2000’s. TIME TO SHRED. Otherwise cardboard boxes to be broken down and to recycling. How did I get started. 1. I thought about what I would do last night……MADE myself stick to the plan I put in place before going to bed. bingo it worked. More to come but this start has inspired me. I love all tips and ideas. I have years of paperwork piling up. I know the need to keep tax iitems, contracts, real estate docs, etc. However, do you know guidelines for keeping all the other things like paid bills, bank statements, credit card statements and all that. I’d love to shred a bunch of this paperwork but I’m not sure. Any guidelines you may have are appreciated. I don’t know the formal rule of throwing out bills and bank statements, but my mother keeps them all and at the end of a year puts them in a shoe box and labels the year. Then the next year when she fills her new box and put s it into storage, she throws out the previous year’s box. You need to keep anything that applies to your tax returns for 7 years – I think that includes bank statements, but not old bills. We get all our bank statements digitally now. They will be on record at the bank whenever we need them. In fact, anything that comes in the mail, if we CAN get it digitally instead, we DO! It helps a lot. Check with your bank….some charge for the paper copies…..
@ Judi: I keep the final year-end statement for things like bank statements, credit card statements, pay off statements, etc. I just file them away with our tax documents at the end of the year, and shred everything else. Ginni is right that tax returns should be kept for 7 years, even business taxes, I think. I would love any ideas as possible. I have so many things in boxes I need to get through and do something with them. Thank you so much for the decluttering tips. I am also in the group where everything in my house is cluttered and unorganized that something needs to be done about it. I feel that my clutter is really negatively impacting my life…I forget things and am almost embarrassed to have people in my house. The bad part is, I can’t find the motivation to get started fixing these issues. I’m a single mother and work full time. Most days I’m away from my house for over 12 hours. I also would like to have a some semblance of a life and don’t want to spend all my free time cleaning house. Do you have any advice as to how I can handle all of this. Thank you so much! Thanks so much for your reply! I’m happy to hear that there is someone else that had the same problems as myself and that there is a way out of this mess. Get the children involved. Have them look at the room with you and find things that can be gotten rid of. Even little ones can help (if your little one is 3, they find 3 things to throw or give away). You may find your teens more ruthless than you are! I’m the family historian; genealogist. Besides taking a bag of things to Salvation Army today; I started to organize some of my genealogy work. Importing info from paper to the computer. I spent 3 hours (on & off) taking care of one family branch. Felt good to start the decluttering!! Thanks for the motivation. Now you have to do a 40 digital bags in 40 days challenge! I SOOO need to clean up my computer, my flash drives, and ALL those CDs I used to stash stuff on… then I also want to create a digital portfolio of all my writing work from college and previous journalism jobs – I have PAPER newspaper clippings!! 🙂 I need to scan and create a file just for those!! I’ve been focusing also on decluttering my heart attitudes. To throw out the negative thoughts and feelings and to replace them with happy/positive. We can easily get bogged down with too much garbage in our hearts. I wholeheartedly agree, and I am guilty of this. I also let others’ negative attitudes get to me and change mine. No more. Nothing good comes of it, we all just get crabby and frustrated being around negativity which makes us even crabbier, haha. I am so glad you took the time to share your thoughts 🙂 I will add “Attitudes” to the post and think of how I can improve my own. Really great tips there! Some of the smallest things seem to take up the most amount of my time!!! I will be digging into many of these! Thanks for the decluttering tips! I need to do all of these things… If I could just get started. It’s a little overwhelming sometimes figuring out where to start, because our entire home/life is cluttered! I need to tame my hoarding ways. Will you come do it for me? Ha. Good luck with your 40 Bags/40 Days challenge. I need to jump in and participate! Figuring out where to jump in or start is so hard – probably the hardest part. I’d love it I’d you joined us, Erin. 🙂 We had a ton of people jump in last night, so you wouldn’t be the only one starting now. I swear if it weren’t for the challenge, with blogging my house would never get organized. Let me know if you want me to add ya, even if you just want to lurk in the group!